Can we stick a price tag on nature? And even if we can—does that mean we should? In recent years, ecological economists have argued that people will never value natural resources properly unless that value can be expressed in terms of dollars and cents. And that's the logic behind the U.N.'s big, ongoing study of "The Economics of Ecosystems and Biodiversity" (TEEB)—a project that's trying to quantify just what the world's actually losing as species and habitats vanish at an alarming rate, casting the damage in raw monetary terms. In its latest report for policymakers, the TEEB authors point out that people typically make decisions to harvest natural resources without taking into account the full value of those ecosystems. For instance, in southern Thailand, shrimp farmers who plow down mangrove forests and set up commercial shrimp farms can pull in about $1,220 per hectare per year. 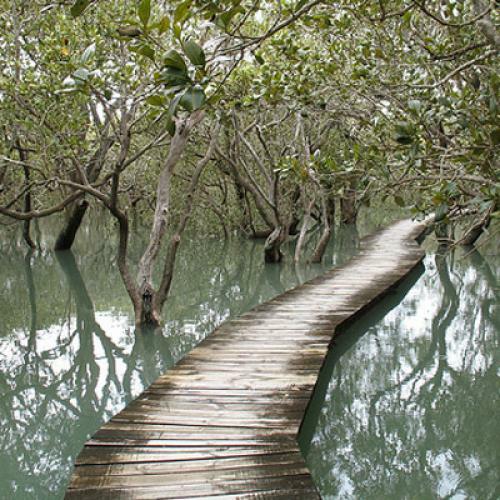 Not too shabby, except that those mangroves provided an estimated $12,392 per hectare per year in benefits, by providing wood to nearby communities, nursing offshore fisheries, and protecting the coasts from storm damages. So there's a real mismatch at work. Partly this is just your run-of-the-mill "tragedy of the commons" situation—the gains from razing the mangroves are concentrated and private, while the broader benefits from leaving the forests untouched are diffuse and not "owned" by any one person. Government regulation needs to play a role. But, the TEEB report argues, the much bigger problem here is that those broader ecological benefits are rarely even considered. Take another example: In Costa Rica, forests are often plowed down for cattle and sugar cane production, earning those farmers an annual income of around $400 per hectare. But recent studies have found that forest-based pollinators actually boost yields in nearby coffee farms—bringing a yearly value of around, oh, $400 per hectare. And that's not even taking into account other benefits of rain forests, like carbon sequestration. So there's a strong economic case for leaving the forests intact. But when cutting down forests, people often only think about the immediate benefits (wood, space for cattle) and not the wider ecosystem's value. On the flip side, investing in conservation can reap huge—and measurable—economic returns. 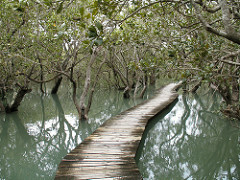 The Vietnamese government has spent $1.1 million planting and protecting some 12,000 hectares of mangroves. That's not just a feel-good waste of money: Since the trees reduce inland flooding and landslides, the country has saved $7.3 million in dyke maintenance. Likewise, Cambodia's Ream National Park generates far more money (from research and tourism) than opening it to development would yield. On the other hand, though, reading the TEEB report, it's clear how relatively little we really know about the importance of biodiversity and how different ecosystems interact. Sure, coral reefs generate money from tourism and storm protection, but are we really sure we know everything about how they anchor marine food chains? It was only recently that people understood how forests in Costa Rica helped boost coffee yields. What if an analysis shows that it's "worth it" to harvest a certain region and then we later find out that actually, the benefits were actually much bigger than we thought? What's more, isn't there room for uplifting appeals to nature? Isn't that why we have national parks in the United States? (Teddy Roosevelt certainly wasn't thinking in raw cost-benefit terms.) Maybe putting a price on the biosphere and using cost-benefit analysis is the best method available for thinking about conservation and sustainability, but it doesn't seem totally airtight, either.